In the land where gambling is believed to have originated, real-money betting faces strict Chinese regulations, limiting players to the state-run lotteries, few government-partner casinos, and legal gambling zones like Macau. Despite last year’s legal market figures showing over 300 billion RMB and the underground gambling sector estimated to worth more than 1 trillion RMB, the gambling industry proves to be highly economical for the Asian powerhouse. However, gambling remains restricted. Bitcoin, as it had done in other jurisdictions, presents a leeway—legal as per the lack of regulations—for casino enthusiasts to place bets on the casinos and gambling platforms operating online using the digital currency. The US players have earned an alternative means to indulge in online gambling, and the Chinese gambling market is not an exception. As the industry flourishes, welcoming more brands offering reliable and improved gambling services became apparent as is the convenience and security bettors relish when purchasing and exchanging bitcoins. For the Chinese market, several exchanges play distinct parts, but it is OKCoin that earns the lead role. A global cryptocurrency trading platform, OKCoin boasts a significant share of the Bitcoin trading volume for the past six months. In fact, the online exchange registered record-breaking figures for its Bitcoin and Litecoin transaction volumes in March of this year, reaching about 293,000 BTC and around 12.9 million LTC. Aside from the glaring statistics, OKCoin successfully handled that much transaction volume without facing major issues, which tend to alienate systems that are rather built on subpar technologies. Given the strong market presence of this Bitcoin exchange, it is only logical for the Bitcoin gambling aficionados in the Chinese market to avail of OKCoin’s services, which, in the long run, positively benefit the budding sector dedicated for online gambling using Bitcoin and other cryptocurrencies. The timing cannot be any more perfect since the number of Bitcoin casinos and gambling sites catering for the players in the region increases. 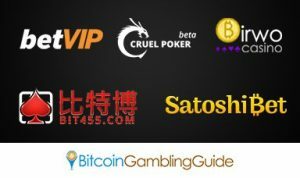 Bitcoin sports betting platforms like Bit455 and BetVIP, casinos like Birwo, and Satoshibet, as well as Bitcoin poker sites like Cruel Poker are some of the excellent venues for Chinese bettors to quench their thirst for prime-quality entertainment.